Greater Manchester digital healthcare company Intelesant has been announced as one of the partners in a new £5.2million NHS Test Bed trial. The trial aims to provide people affected by dementia with the latest technology to help them stay in their own home for longer, thereby reducing hospital admissions. 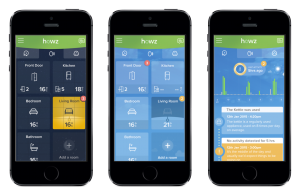 Intelesant’s role in the Internet of Things Test Bed, led by Surrey and Borders Partnership NHS Foundation Trust, is to provide the use of Howz, an app developed predominantly for older people, typically living alone. By analysing energy usage and data from sensors that track heat, light and movement, it is a way of non-invasively understanding a person’s daily routine. The data is fed into live updates within the Howz app interface, notifying care givers and family members of any abnormalities that may indicate that a problem has arisen. A total of seven NHS trusts across the country have been awarded grants, funded by NHS England and Innovate UK, as part of the first wave of this NHS Innovation Test Bed project. This particular trial will involved involve recruiting 1,400 people to test how technology in people’s homes can be used to pick up information about their behaviour. NHS chief executive Simon Stevens said: "Over the next decade major health gains won’t just come from a few 'miracle cures', but also from combining diverse breakthroughs in fields such as biosensors, medtech and drug discovery, mobile communications, and AI computing. “Our new NHS Test Beds programme aims to cut through the hype and test the practical benefits for patients when we bring together some of these most promising technologies in receptive environments inside the world's largest public, integrated health service."